February 27 and March 6 at 8 p.m. in the FMPA Theater Hall. 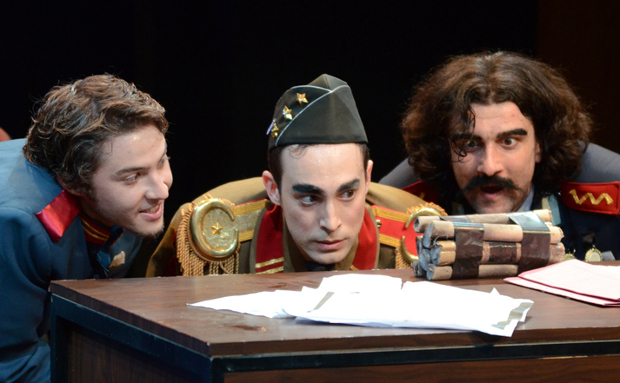 Written by Polish playwright Slawomir Mrozek, the 90-minute play is a comedy in the “theater of the absurd” style. İlham Yazar, instructor in the Department of Performing Arts, is directing the Bilkent production, which had its premiere on February 20. “The Police” takes place in a mythical country where all opposition to the state has disappeared and the last remaining political prisoner is to be released. Rather than face the prospect of retiring the police force, the chief of police decides to create an enemy of the state by ordering one of his officers to commit political crimes. The absurdity of the play culminates when the characters mutually arrest each other repeatedly, in an attempt to restore order and meaning to their world. Students taking GE 250/251 will receive points for attending a performance of “The Police.” Also, for those needing transportation to the center of Ankara following the play, a bus will depart from the FMPA building for Tunus bus stop at 9:45 p.m.
Tickets are available for general sale at MyBilet. For more information, please see bilkenttiyatrobolumu.weebly.com, or call the department at ext. 1620.